Okay. My love of statistics knows no end. Three stat related topics, one of them seasonal, all of them useful..ish. Google Zeitgeist 2007 has now been published. There is nothing too surprising this year although it’s great to see the Wii top the poll as Christmas comes around. Great stock management Nintendo. Definitely keeps people thinking you are the must buy games console. Also worth noting that HD-DVD is more searched than Blu-Ray despite Blu-Ray disks outselling HD-DVD and that more people want to know what love is rather than who God is. More stats can now be found on Flickr. If your a pro user, activate your stats and in roughly 24 hours you too can see who is viewing your photo’s. As expected nobody is finding any of my photo’s interesting but it did remind me to get my tagging and geo-tagging sorted. The stats are really well presented. Clear with lot’s of white space. You can also dig down into screens that show more details i.e. all photo’s. You can then sort by comments, date’s, your photo’s that have been added as a favourite by other members. Very informative and a great place to waste a few minutes. I even found some photo’s that I had put up that I had totally forgotten about. Now onto a festive stat. Well, when I say stat I really mean reviews. My friend Roy has been road testing Mince Pies (not to be confused with mince rounds). So far the mince pie to beat is from Starbucks. I’m in shock. 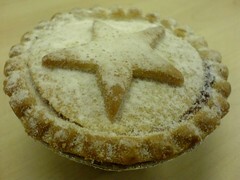 Having just sampled a Marks classic mince pie I really must seek out a Starbucks version over the holiday period. Anyway, if you have any more recommendations for Roy and his co-workers to test then add a comment below and I’m sure they will oblige. I hope to have my own further stat/review post up this weekend. Stand by for startling revelations!